we've had a few days of indian summer and a few biting chills that foretell the coming bitter months. but it is here, and with it comes a slowing of my creative blood. so, today i begged again, and she said if i make it another challenge to the end of the month she may play a bit more with this canvas. i won't bore you daily with this small challenge, because the tiny differences won't be apparent to anyone but myself. except today. i'm gonna bore you with the minute details today. i have dabbled here and there on the girl and the focal flower without blogging for the same reason. small changes are boring. i'm trying to get more depth to the girls features and make the lily sparkle a bit more. i've changed her hair and eye color a couple of times and have been working on both again today. the eyes still need more for me to be happy with them. i think i'm finally happy with the depth of her hair color. several layers of several colors and a glaze over it all. a few days ago i added an iridescent pearl over each petal to see if i liked the sparkle. i did, but it wasn't what i had expected of the color, so i added a glaze of the quinacridone magenta i used to begin with, and that did the trick. this lily is a beautiful rich sparkling color that i am thrilled with! i know that getting to the finish line with this painting is going to take some work. i'm not only battling my own 'junk' getting to the studio, i have my almost 16 year old pup, pita, who must be by my side but hates being in the studio for some reason. when i bring him down, he runs around, trying to get my attention, tap dancing like he has to go outside. we have done this routine so many times. he goes crazy, i bring him upstairs in order to go thru the house to the dog area outside, only to have him run to the living room instead. as soon as i let my guard down and ignore his tap dancing, he will go pee on my studio floor. i am always on edge with him, and he refuses to settle down. if i leave him in the living area of the house he will run around barking and i worry about his heart issues. it's just a frustrating situation right now with him in his old age. i have been very busy while the pups and i form a cuddle-puddle on the couch. 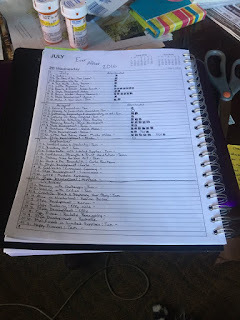 it's getting close to the end of the year for my yearlong Life Book workshop, and i need to make sure all video content and pdf's are downloaded before the beginning of next years workshop! i have a couple of other art workshops i'm taking, and each class has it's own download page to make sure i'm up to date. it's good to be organized, and it's something i can do while pita stays happily by my side on the couch.